So we are back in full swing after a refreshing break, and the first piece of news for you is that Dovetail Games will be doing a Live Stream preview of the Peppercorn K1 tonight at 5pm UK time. Also we are currently finalising the work schedule for next year and we plan to announce the 4 new locomotive add-ons we intend to release during 2016, later this month. 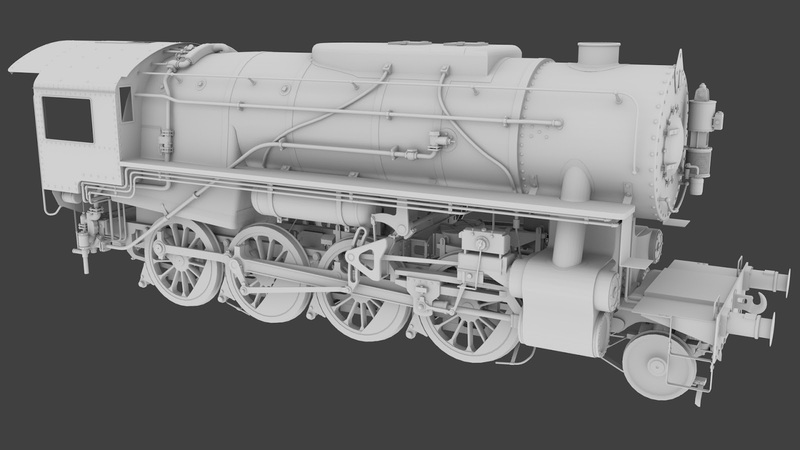 And of course, after quite a long delay we are finally getting back to work on the USATC S160! As some of you are probably now aware, we were approached in January by Dovetail Games in regards to their desire to build the 1950's Riviera line for the upcoming TS2016. What started as a small involvement with us offering advice on areas to focus on, rolling stock to include and features to add (GWR ATC for example), then became a full-time involvement where we provided set up and additional scripting for all of the included tender locomotives, created the locomotive side of the water trough functionality (visuals and script) and built the Driver Assist system. During this time the Wear Valley route was also released and so we had to complete the K1 locomotive as well. But we are now focused on the S160 and intend to have it completed by the end of the year. And to that end, we've been adding more to it this week. So last we left it, a lot of the detail under the boiler had been added but the frame still lacked a rear section. As you can see from the images further down that rear section has been added. 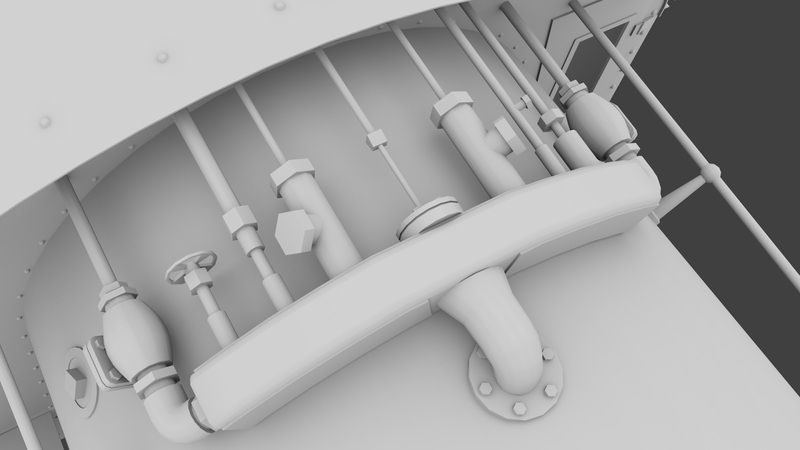 Also a lot of the cab has been detailed, including rivets - this is actually really useful for measurements when adding other nearby components and as we've said before can provide some relief from the more complex modelling. The next component to tackle was the manifold. One of the features of the S160, typical of many austerity designs, is that many of the working parts that are usually covered with panelling are left open to save on time and materials, and the external manifold is typical of this. There's a lot going on there! Once this was in place we set about adding the injector equipment - the pipes and valves that allow the pushing of water from the tender into the locomotive's boiler. The S160 was originally fitted with side injectors - the water enters via valves either side of the boiler. However later some of them were fitted with a more efficient top feeding system, and of course with all the pipework on show this means modelling 2 completely different set ups. Also added after this were the side pipes that follow the running boards which include the brake pipes. 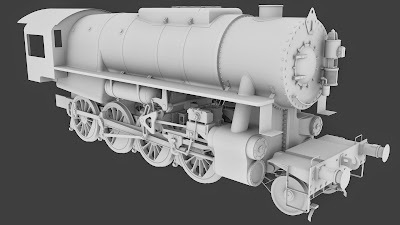 The ends of these are noticeably missing at the moment as the next job is to model the 2 different brake versions that were fitted - the air brake and the UK vacuum brake which have different connections and locations. We hope to get back to these weekly blog updates from now on, and do keep an eye out for the new product list coming later this month. Also if you're interested in the Peppercorn K1 make sure you watch DTG's Live Stream later today. fantastic work cant wait for the live stream !!! I'm afraid I might have to miss the live stream as it's too early for my schedule today, but I'll watch the recording with great interest! Good plan. I believe you can watch the stream later up until they record another one, and then once it's up on YouTube we'll put a link to it as well.